Riesling grapes naturally express the terroir in which they are grown. 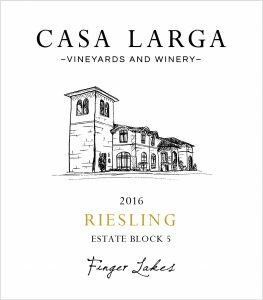 They grow happily at Casa Larga, producing delicious aromatic wines from crisp and dry to smooth and sweet, with beautiful natural acidity and a range of flavors from green apple to mineral. Viticulture notes: We hand-tend each Riesling vine to enhance sun exposure and fruit ripening. Crop levels are closely controlled to allow the fruit to express maximum aromatic intensity and complexity. Fermentation: In stainless steel tanks at low temp. Winemaking notes: Small lots of estate-grown fruit are picked and fermented separately in stainless steel tanks at cool temperatures to preserve the aromatic integrity of the variety. Fermentation is closely monitored and arrested at a point where the residual grape sugars are balanced by the wine’s natural vibrant acidity. We bottle the wine young to preserve its crisp and fresh character. Availability: At our winery; at CasaLarga.com for direct shipment to customers in 38 states. Aging: Store at 45º-55ºF, out of direct sunlight. These wines are produced to be enjoyed while young and fresh (within about 2 years of bottling). Tasting Notes: Block 1, the oldest section of our vineyard (1975), yields wines with more weight, balancing the natural acidity without residual sugar. This dry wine exhibits mineral notes that perfectly compliment fresh fish and shellfish served simply with lemon. Tasting Notes: Block 2 (1980) is rockier than other parts of our vineyard. It produces lower-yielding vines with small berries and loose clusters which intensify flavors. The stone fruit notes of this lovely wine pair deliciously with ham, pork and turkey and their traditional sides. Tasting Notes: We delayed picking a small section of Block 4 until November. The result is this delicate sweeter Riesling reminiscent of Auslese, with a honeysuckle nose and pear on the mid-palate. Enjoy with hot and spicy dishes, blue-veined cheeses, and desserts. Tasting Notes: This wine exhibits the classically Riesling green apple notes that pair with a wide range of meats. Block 5 (2003), the youngest section our vineyard, slopes to the north. The less intense sun exposure that favors vibrantly aromatic grape varieties.